823 pages | 334 B/W Illus. 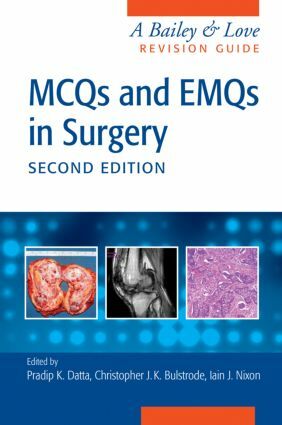 Divided into 13 subject-specific sections and written by expert contributors, the MCQs and EMQs provide comprehensive coverage of the current surgical curriculum as well as the core learning points as set out in Bailey & Love. The book is ideally suited for the MRCS exam as well as for the first part of the FRCS (General Surgery) and the new Intercollegiate FRCS (International) exams. The book emphasises the importance of self-assessment within effective clinical examination and soundly based surgical principles while taking into account the latest developments in practice. This new edition includes many new contributors and enhanced chapters with answers provided in much greater detail.